A lot of new racquet models are being launched around the time for the US Open and it’s time for another episode in the eternal battle between power and control. For more information on new racquet updates, check out my post “The Hottest Racquets Right Now“. The current trend in the racquet-making industry is making a stiff and powerful racquet and then adding a substance/technology to dampen the shock to the arm. It’s a known fact that elbow, shoulder and wrist injuries have increased in tennis, both on the ATP Tour and among recreational players. The sports has gotten faster and the hitting zone have moved higher with the massive amount of spin being put on each shot. For the ATP tour this is becoming an issue since there are far more retirements these days than for example ten years ago. Paying customers are not getting the anticipated match they’ve been looking forward to and fans are missing out on seeing their favourite player perform. Same thing happens among amateurs where most people aren’t even at half the fitness level of a tennis professional. Result: even more injuries that have people putting their racquet bags in the closet. So the lure of extra power often comes at a price. Another issue among amateurs is that people play with faulty techniques and would benefit from watching some YouTube videos on tennis technique or going to a coach for a few sessions. The improvement potential of most players is massive! But if we just look at the equipment, I believe it’s better for most players to use more flexible racquets, especially if you can’t keep changing strings over and over again (unless you have your own stringing machine , it will get expensive). Nowadays most recreational players want to hit like their favourite player and if that is Rafael Nadal, they will get a Babolat Pure Aero , string it with Babolat RPM Blast and hit the courts. You’ll get massive power and spin with this setup, but of course at a price: the setup, especially if tightly strung, will put a lot of strain on your joints and ligaments. Yes, you will be able to hit some really great shots that will require more from you with a more flexible racquet, but is it really worth risking pain and injury from it? 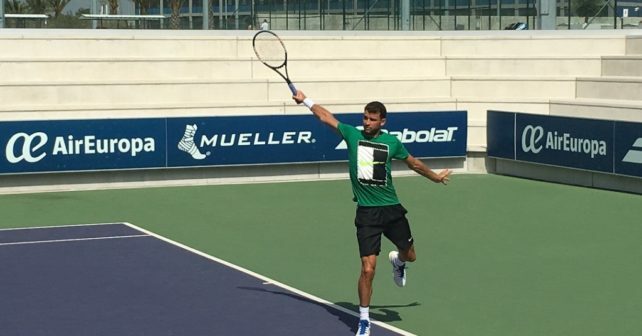 I understand a lot of players on all levels like power in tennis as much as a guy or girl likes a sports car, but in this case it might be detrimental to their tennis playing health. I’d rather play with a “wet noodle racquet” (like the Prince Tour 100 series) and be injury free, than bash some cool-looking balls but play a lot less tennis. That’s just my preference. And if you work on your technique, it’s highly possible to murder a tennis ball also with a very flexible racquet (just watch a guy like Argentinian Nicolas Kicker, who plays with the ultra-flexible Prince EXO3 Tour 100). The point here is to think twice about your setup, especially if you’re feeling pain from time to time. Lingering discomfort that you can live with can easily turn into a full-blown not-playing injury. But this is the constant struggle in the industry and among pro’s and amateurs: you want the racquet that is best for your game – not your health. As most of you might know, I try a LOT of racquets in year. It is part hobby and passion. It’s not really beneficial to my game, but it’s fun and educational. I usually play with racquet in competitive matches for six months and then I switch. I think that time is coming again soon. 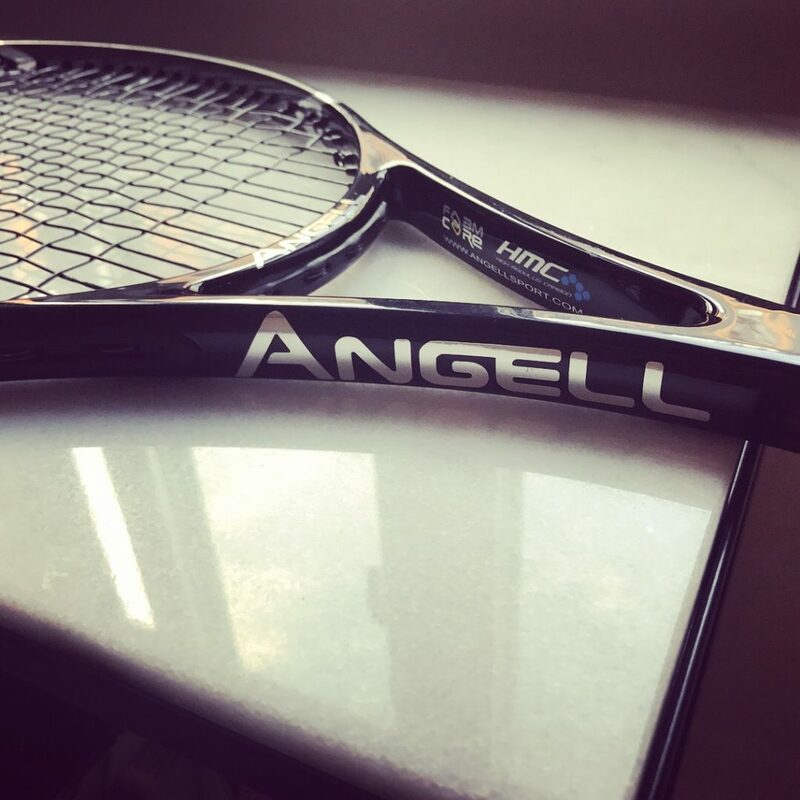 After playing with the Babolat Pure Strike 16×19 (click link for review) happily for a few months, I’m considering switching over to the Angell TC 97 Custom which I’m enjoying a lot at the moment. Next step is to try the racquet with the soft Angell Halo 1 string (review to come!). What I enjoy about a softer racquet is that I feel my technique is improving. I need to hit the ball with my entire body and I can do it without the ball going out. The Babolat Pure Strike has a lot of nice power (not as much as Pure Drive, but more than an Angell), but sometimes I feel it’s too much, especially when the strings are losing some of their tension. On the other hand, it does give me some “get out of the jail free” power when I out of position and on the defence, which is attractive. Another slight negative is that my arm can feel a little bit sore at times with the Pure Strike, something I never feel with more flexible racquet and I always string my racquets rather loosely. The truth is that there is simply no perfect racquet. You need to find a good compromise that helps your game improve. This might of course change over time as your game changes (if you work on it) and then it’s fine to get a new setup and work with that. So in my own eternal struggle of power vs control, I seem to be going to-and-fro, back and forth. With the Pure Strike I had power and decent control, with the Angell I have control and decent power. I keep searching for that perfect sweet spot, that ultimate mix of them both. I’m quite sure it doesn’t exist, but I do like the search on its own. It gives my tennis some weird and enjoyable meaning. What racquet quest are you on at the moment? What are you swinging and what are you eyeing? Let me know in the comments field! If you’re into arm-friendly racquets, check out this post and if you’re out to buy a racquet, here’s a list of affiliated stores with a good selection! When i was a teen i played with the six one team (2010) and then blade (18/20) 2013. Now with a Pro Staff 95 (2014) with a Gamma moto (pink to match the racquet) at 54 pounds! Loving it, stiff stick though, but it made me play with more body (torso rotation and legs)motion, so i can get the maximum power out of every shot, it got the game a little more “harder”, but i got better result overall. Really enjoying your blog. Read almost all of it! Following your recommendations, I am now looking into 2 options: Prince Textreme 95 vs Angell 96, both of which seem to have everything I like about racquet (315g+, good swing weight, control-first AND arm-friendly). How would you compare Prince Textreme 95 with Angell 97? I know, that you were a fan of 95 racquets. Was there a reason you opted for Angell 97, but not Angell 95? Just as you did- I somehow enjoyed 95 frame and the level of control I could get out of it (especially after switching from 100 frames). I can generate enough power on my own, thus racquet being powerful – is not a concern of mine. What I’m really looking for is arm-friendliness and comfort/control. Not sure, if someone told you, but your blog will probably help more people stay healthy and enjoy tennis, than entire TW with their reviews in the next 1mil years. You’re looking into two great racquets. The reason I’m gravitating towards 97-98 inch racquet these days is that I want a slightly larger sweet spot and margin for error as I’m trying to inject a little more spin into my shots. But 95 inches is fine too of course! Choosing between the Angell TC 97 Custom and the Prince Textreme 95 tour is not easy. The Textreme is even more low-powered than the Angell in my opinion, but they both offer great feel and stability. In the end, I would tilt my head slightly towards the Angell TC 97 Custom because you can choose your own specs, but you’ll do fine with either racquet. Let me know how it goes and good luck on the courts! It’s Angell definitely than. Thank you and keep up a great work you’re doing with you blog!